Live, virtual kid-friendly, booty kickin' workouts, yoga, meditation, health tips and motherhood musings + access to a library of past videos. 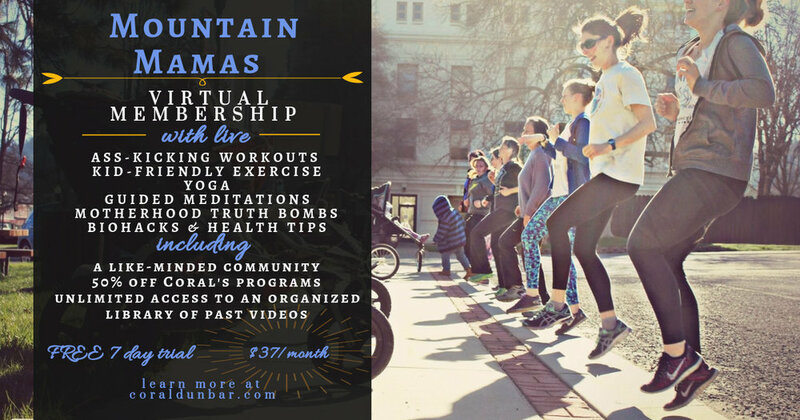 What is the mountain mamas membership? Often we enter motherhood and lose our ability to prioritize exercise and self care. As a mom of two kids, I can only fit my workouts in if I include my kids and make it part of our daily routine. I created this program to inspire you to get fit with my live kid-friendly workouts and yoga classes. Every week, I host at least one (or more!) live video via our facebook group. At the beginning of the week I'll post the live schedule so you can see if you can join in realtime. Any time of day, you can access my catalog of workouts and videos. Say you have 15 minutes to workout, and your kids are with you...you will just click on my kid-friendly workouts tab and pick a video that's calling to you. After your free week trial, the cost of the membership program is $18/month. This includes access to our private facebook tribe, to my video content library and 50% discount off any of my upcoming coaching programs. Cancel your subscription any time. Do I need to be a mom to sign up? Absolutey not! Some of the workouts I do are geared towards moms who don't want to wait until their kids are napping to get their workouts in (which will still kick your butts without a kid), and some are better to do with no distractions (a lot of my yoga classes are best without kids). What is a mountain mama? Definition of a Mountain Mama - a kickass woman who doesn’t let life get her down, no matter how many rivers she has to forge or mountains she has to scale. She prioritizes her mental and physical health, as she knows she can’t be her best self if she isn’t taken care of first. She appreciates the beauty of the sunrise and weathers the thunderstorms that come her way.